Simple Apple & Chicken salad – For this, the required ingredients are 3 cups of precooked chopped chicken breast, crunchy apples chopped, chopped celery, roasted nuts of your choice crushed, 1 cup yogurt, onion powder, salt and ground pepper. All you have to do is put all the ingredients in a large bowl and mix. While this quantity may be good enough for 2, if you have more members to share your table with, you can increase the quantity of the ingredients accordingly. Basic Egg Salad for Fall – Take 6 hard boiled eggs, 2 table spoons of mayonnaise (preferably with low fat content), 2 cups of diced and steamed veggies of your choice, 1 tablespoon of roasted nuts, salt and pepper. The recipe is simple. Run a knife over the eggs to form little chunks. Add the chunked eggs, steamed veggies, mayonnaise and nuts in a salad bowl and mix. Add the salt and pepper to taste. Easy Trout Salad – For this, you will need 2 cups of smoked trout that have been skinned and flaked. 2 tablespoons of red onions and a celery stalk finely chopped; 2 table spoons mayonnaise, 2 tablespoons sour cream, 1 tablespoon fresh parsley, 1 tablespoon fresh lemon juice and salt and pepper to taste. The procedure is no different. All you have to do is take a salad bowl and mix the ingredients. Serve instantly or stock it up in your fridge for later use. Cottage Cheese Salad – This is perhaps the simplest of them all. The ingredients include 2 cups of fresh cottage cheese, 2 large onions diced large, 2 cups of steamed vegetables of your choice, 2 large tomatoes diced, 1 tablespoon lemon juice (optional), salt and pepper to taste. Here again, all you have to do is mix the ingredients in a large bowl and enjoy! 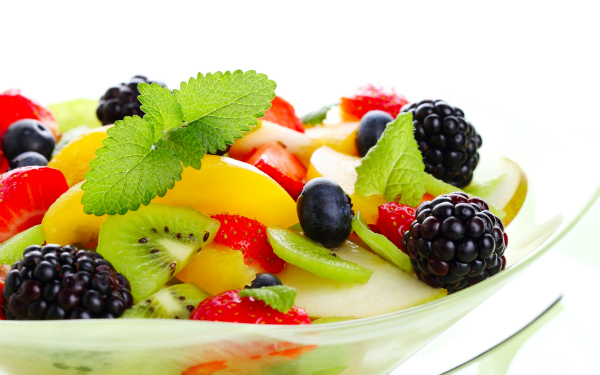 Autumn Fruit Salad – This is the tastiest and healthiest treat that you can grant yourself and your family in the festive season. The burst of seasonal fruits with a touch of innovation can go a long way into adding glee to your meals. For this, you will need 2 crunchy apples, 2 pears, 2 bananas, a cupful of grapes, 2 cups of fresh yogurt, ½ cup assorted roasted nuts, 2 teaspoons cinnamon powder, ½ teaspoon ginger powder, 1 teaspoon nutmeg and a little salt to taste. Mix all the ingredients perfectly in a bowl and serve.